With that we finish off Kengo’s arc, now onto Kyousuke. As with all the other episodes, it was really condensed. I still thought it was well done given the time constraints on this episode and how much happens in Kengo’s arc. Next, we can have all the Rin pictures! Even Riki gets some flashback pictures this week. Now for the route end and all the emotional goodies. I feel like they are pushing this “secret of the world”. So ends the Masato chapter/arc, pretty interesting take on it. Although it was a bit condensed, it still had impact and was something I’ve wanted to see animated for quite some time. Anyways, here are the weekly pictures. First off we start with all the cute Rin, as these aren’t “spoilerific”. Then we have our main character for this episode, Masato. Now we have the major spoilers in our flashback. Next week is Kengo time. The Refrain arc finally begins in episode 7 of Little Busters! ~Refrain~. This week we had a lot go on and yet another time loop begin. Now for our usual Rin pictures! Man, missing the good old days here. Well, that ends the Rin2 arc of Little Busters! Onto Refrain we go, can’t wait, so much hype! Here is the daily dose of Rin and other assorted pictures. I miss the Little Busters! already! Sad Komari = Not good. Kyousuke in S1, not so different eh? Just thought I’d make a post at some point about an interesting opportunity I got over at Visual Novel Aer a few weeks back. Tay was interested in interviewing me and gave me this wonderful opportunity. The interview was posted last week but I was too busy to post about it last week. Anyways, I just thought I’d share this on my own personal blog as well. 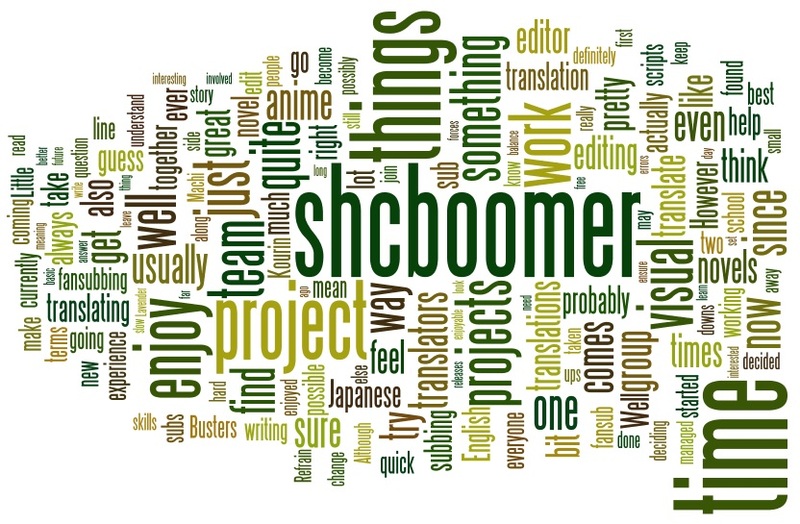 Via Tay: I have always been very impressed with shcboomer, and when I had the idea to start a blog series focusing on the community, his name was the first to pop into my head. As I told him before the interview, I’ve always appreciated his interesting and thought-provoking posts on the Fuwanovel forums. Yet, he’s also been a thorn in my side: he’s incredibly active in multiple projects, and thus makes it hard to keep track of him in my VN-Community-Map spreadsheets! In any case, I hope to better introduce shcboomer to you today. I’m very grateful for his willingness to be the first spotlight, and for taking the time to be interviewed. Thanks again for the wonderful opportunity Tay!